In an earlier post I mentioned the new Levis Capital E Premium Denim range for women. 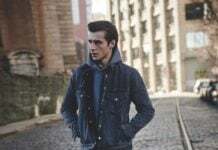 Finally I have found details of some of the men’s styles including the Skinner Manchester which is low rise with a slim leg flaring through the calf in a boot cut. The hand-fading looks great with high-contrast fading through the seat, lap and knees, and whiskering through all stress points front and back. While the whiskers and fades are intense, the denim comes in a stiffer, more raw-feeling texture for a distinctive look and feel. These and other Capital E jeans are not available in the UK but can be bought online from UrbanOutfitters in the USA.